Gunsmiths have told me that, even though it is thought to be OK to dry fire a revolver with empty chambers, it is better to have either empties or snap caps in the chambers for dry firing, especially if you plan to do a lot of it. I first bought a set of Triple-K plastic snap caps. They were puny and pathetic. They lasted about one cycle through my .357 Magnum before they shattered, literally. They also have another weakness: they are flat on the front, making them undesirable for reloading practice. 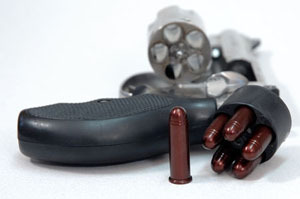 One of the more difficult aspects of handling a revolver is achieving a quick reload. It’s something which should be practiced until the reload is smooth and swift. If you get a chance, watch a video of Jerry Miculek shooting, and notice how smooth and fast he reloads his revolver. Practice and multiple repetitions are essential to achieve real competence in this procedure. Not being Jerry Miculek, my reloads are the pits, and I wanted to practice them. I needed a durable dummy round that would stand up to heavy use, both in speedloader practice and dry fire. If you have reloading equipment, it is possible to build dummy rounds with no primer or powder, but in my experience, these can become a management issue. Since they look so much like ammunition, they have to be marked with paint and kept separately so as to not be confused with the real thing. I have also found that the bullets in dummy ammo tend to work forward with repeated dry-fires, eventually rendering them unusable for practice. A-Zoom Practice Ammo is one solid piece of aluminum which is anodized with a burgundy color. The bullets don’t come loose, and they are not easily confused with really ammo. I discovered A-Zoom Practice Ammo Rounds while surfing around the web. A-Zoom snap-caps are precision CNC machined from solid aluminum to exact size, then hard anodized. This hard anodized surface provides for ultra-smooth functioning and long cycling life. 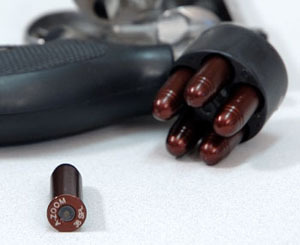 The highly durable dry fire “Dead Cap” can take over three thousand dry fires while protecting the firing pin. The manufacturer states that A-Zoom snap caps last over 30 times longer than conventional plastic snap-caps. A-Zoom Snap Caps are available in over 130 sizes from 50BMG to 22 Hornet. The .38 Special snap caps that I purchased are shaped like lead round-nose .38 Special ammunition so the practice reload with a speedloader is an excellent simulation for live ammunition. In short, the A-Zoom is a better snap cap. Especially if you practice dry fire and speedloader drills, I highly recommend them.